Select retailers, DME providers and health care institutions are eligible to purchase Gelmix & Purathick wholesale online. Please sign in to your Account below or Apply for a new Wholesale Account today. Enjoy free shipping on orders over $1000. I have a Wholesale Account. I do not have a Wholesale Account. 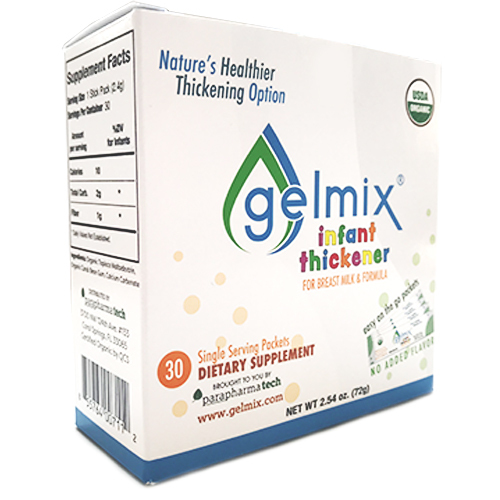 USDA Organic Gelmix Infant Thickener for Breast Milk & Formula. Each Case includes 12 Gelmix 125g jars. Each jar includes 52 servings and a 1/2 serving (1.2g) scoop. Each serving (2.4g) thickens 5-6 fl oz to slightly thick (thin nectar) or 3-4 fl oz to mildly thick (nectar). Not for use with infants under 6 pounds and/or born preterm currently under a corrected age of 2 weeks (42 weeks PMA). USDA Organic Thickener for Breast Milk & Formula. Each Gelmix 2.4g Sticks Box includes 30 individual serving 2.4g sticks. A case includes 12 boxes (30 sticks/box = 360 sticks/case). Each stick (2.4g) thickens 5-6 fl oz to slightly thick (thin nectar) or 3-4 fl oz to mildly thick (nectar). USDA Organic Thickener for Hot & Cold Liquids. Each Case includes 12 Purathick 125g jars. Each jar includes 52 servings and a single serving 2.4g scoop. Each serving (2.4g) thickens 5-6 fl oz to mildly thick (nectar) or 3-4 fl oz to moderately thick (honey). Not for use with infants or children under one year old. USDA Organic Thickener for Hot & Cold Liquids. 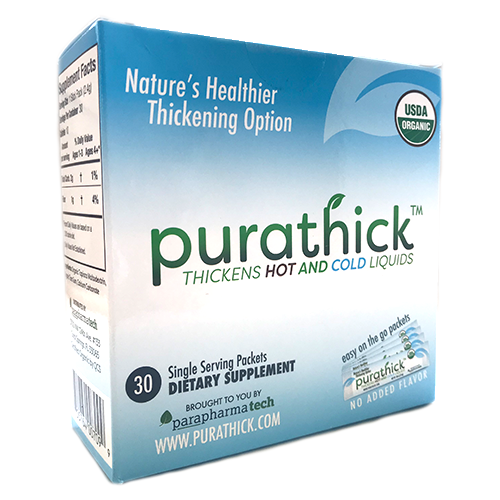 Each Purathick 2.4g Sticks Box includes 30 individual serving 2.4g sticks. A case includes 12 boxes (30 sticks/box = 360 sticks/case). Each stick (2.4g) thickens 5-6 fl oz to mildly thick (nectar) or 3-4 fl oz to moderately thick (honey).